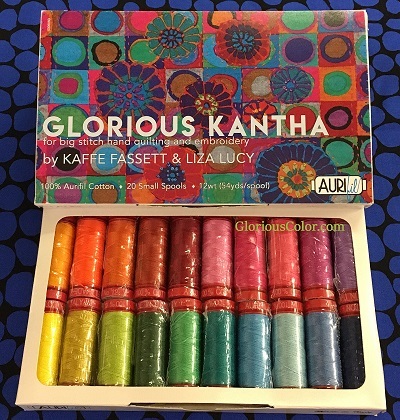 This Glorious Kantha set includes twenty 54-yard spools, one in each of the following colors: 2260, 2395, 1104, 2235, 2145, 2120, 5022, 2479, 2530, 4020, 2892, 4093, 2860, 1231, 2535, 2520, 2805, 1320, 2725, 2780. The 12-weight thread is appropriate for big-stitch hand quilting and embroidery. Kaffe loves to use these for his "toe-catching" quilting stitches.